In case you haven't heard, this is a banner year for Snowy Owls coming down from their usual far north areas into the U.S. 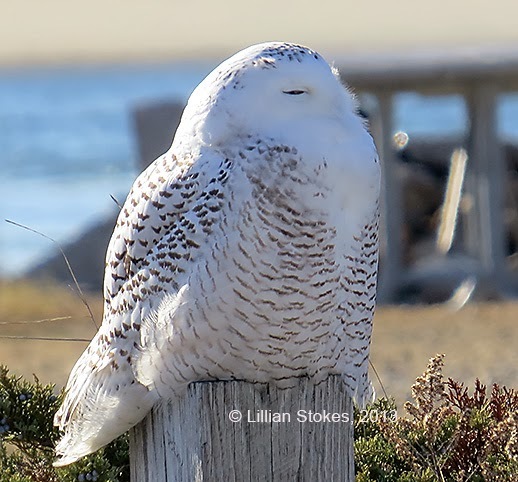 Snowy Owls are being seen in record numbers across the northern parts of the county especially in the Northeast quadrant and have been spotted as far south as Bermuda! If you go to this ebird map you will see the New England coast and other areas just lit up with sightings. 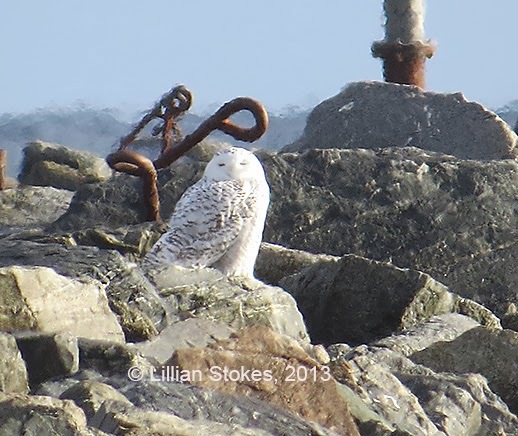 I traveled to the NH coast on Nov. 30th and got these above photos and we saw 9 Snowy Owls that day. 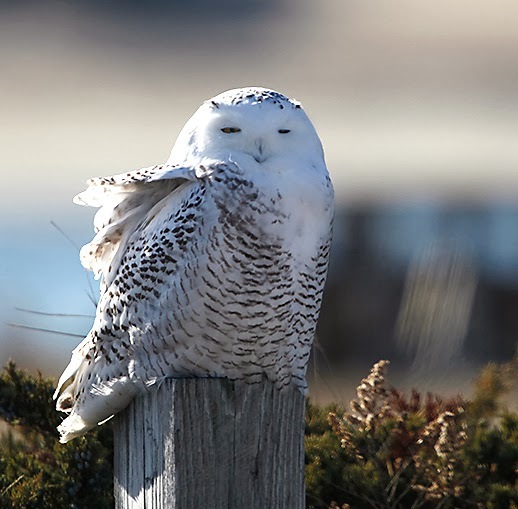 Snowy Owls are creatures of the tundra so when they seek out wintering areas they search for habitat that looks like tundra, such as coastal dunes, marshes, and large grasslands. These owls mainly eat rodents (especially lemmings) and sometimes ducks and seabirds. Although some winter in the U.S. each year, many must leave their northern areas in winters when their food is scarce. Some people think the lemming population in the north many have crashed this year and this is why the owls are leaving, but if there is a good breeding season and too many owls are produced for the food supply, that may force them to leave also. If you see a Snowy Owl please observe and photograph it from a distance and do not harass it.. Many of these owls have made a long journey and are starving and need to conserve energy for hunting. I took my photos from a car at quite a distance and I used long telephoto lenses, either my Canon 1D Mark IV camera with 500mm lens plus 1.4 teleconverter, or my Canon SX 50 which has a telephoto that can go out as far as 4800 mm equivalent. Hope you get to see a Snowy Owl, these are magnificent creatures! For more of my photos of Snowy Owls go here. those owls are simply amazing --- Simply the Best! 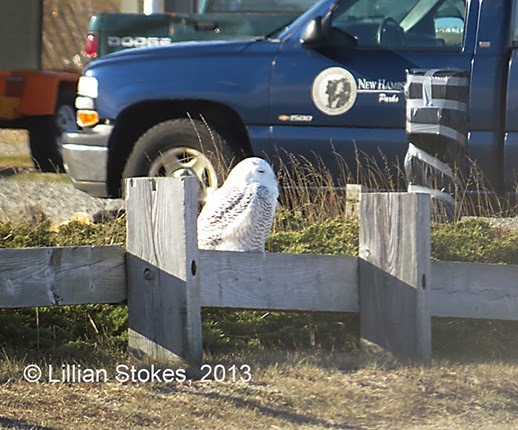 Great sightings and photos, Lillian! That is an impressive number of Snowy Owls that you saw! I just got my lifer on Tuesday. You'll see it on tomorrow's post. Josh, So glad you got to see one! Good tips! And incredible birds! Snowy Owls are certainly a sight to behold! I think I would have been beside myself seeing nine of them in one day. Very exciting, Lillian! Last week I spotted two of these beautiful owls in Michigan. I hope to see two or three tomorrow in Chicago. Terrific photographs, as always!